Eagle Eye Holiday Home is situated at 2100 feet above sea level & is spread over 130 acres of lush greenery amidst plantations of coffee, spices, medicinal plants & orchids overlooking the scenic misty valley of the Western Ghats. 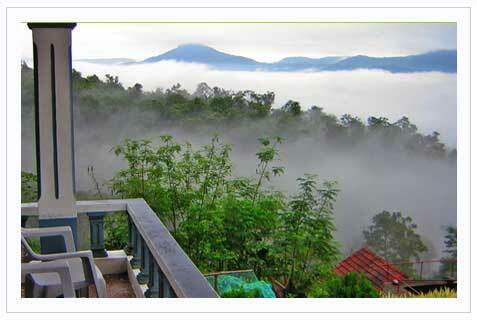 One can have an Eagle’s Eye view of the fabulous Kuduremukh peak right front the inn. Eagle Eye is the ideal place for one to enjoy a complete Holiday Getaway. One can choose to be on the adventurous side and enjoy activities like Fishing, Boating, Trekking, Rock Climbing, Target Shooting, Bird Watching and Outdoor Sports. Cuisine : Being a plantation retreat, they serve you tasty and palatable food consisting of both veg. and non veg menu. During evening, they can organise a good barbecue too at an additional cost for you. Tariff is per couple per night inclusive of accommodation on twin sharing basis, one session of lunch, dinner, breakfast, tea/ coffee, welcome drink, fishing, coracle ride, plantation walk, bird watching, forest trek, indoor/ outdoor games and taxes. Check in 12 noon / Check out 11 am. Children below the age of 6 years will be complimentary. Children between 6 to 12 years will be 50% of the tariff. Above 12 years will be considered as an adult. Activities possible at an additional cost: wildlife safari, target practicing, adventure trek, river side camp, sightseeing and adventure activities. Same rates are valid for foreigners too. Tariff subject to change without notice. Cancellation or postponement is as per hotel guidelines. Bangalore to Eagle eye would be 280 kms, via hassan - chikmagalur - aldur - kadabagere - kadvanthi. It is app. 9 kms from Kadabagere.